Shopping has become part of everyone’s life. Every individual has his own perspective for shopping. Some do it for necessity while others do it for fun. Handbags over the period of time have become a favourite accessory and must have item for women. One of the latest sensations in the market of handbags is wayuu bags. The Wayuu community is found in La Guajira, located in the northernmost part of Colombia. The area is breathtakingly beautiful with an orange desert opposite to a deep blue ocean. The surprising thing about the area is that drinking water is also to be purchased. There are no taps from where you get adequate water. Women here live in Rancherias, which are secluded settlements comprising five or six houses. The people here seldom live in a large settlement or town. Weaving wayuu bags is the bread and butter of women of the Wayuu Community. These are beautifully designed bags which are loved by women and children both. These bags are also a representation of Wayuu culture. Each handbag is manufactured by a single woman having her own signature and every designed handbag has a specific significance. These handbags are usually small in size, which can hold small items. These handbags can be useful for a day or night outings and are the perfect size for kids. Moreover, these bags also carry cultural significance. Wayuu people are the people of sand, sun and wind. The women here have been making these bags since generations. The bags are specially handcrafted with tribal designs and beautiful colours. The designs woven on these bags are the representation of natural elements and the culture of the Wayuu People. It takes around 10-15 days to complete a bag, but the Wayuu women necessarily do not spend their whole weaving and crocheting. In between their daily schedule, they spare some time for this. It may be like spending some time in the morning and then doing kitchen chores. Later in the day while doing house chores, they may spend some time for weaving. For double threaded Wayuu bags the time duration is around five hours and for single threaded it is around 10 hours. In this time span, the time to weave the bag´s strap is not included. The straps are made by men of the Wayuu community. After all, they also want to help their women to earn a livelihood. 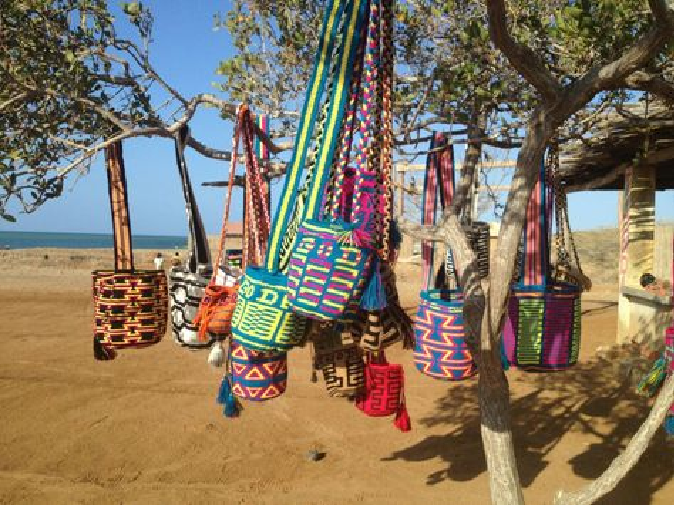 How Do Wayuu Women Sell Wayuu bags? The women here live in Rancherias. In order to put up bags for selling, Wayuu women have to get them to the largest town/city of la Guajira, Riohacha. Usually the representative collects all the woven bags and goes around the city to sell them. In other cases, women visit the city and sells them to a provider who can commercialize the bag and add straps. Wayuu bags are indeed a rare masterpiece which is pure eye candy. These colourful and cultural bags have been used by people for many generations. If you talk about fashion statement this bag is no less. Women of the present era are simply in awe of these handbags. The weaving of these traditional handicrafts has been in practice over 100 years ago. Wayuu women at a very young age are taught the art of crocheting these bags. The designs of these bags are influenced by the beliefs and surroundings of this place. As per belief, women here are taught to weave these bags and make a beautiful eye catching pattern. A proper communication is key to success to any dealing. A proper communication can help to choose the best wholesale Wayuu provider. This way, there will be clear and proper understanding with the provider and no barrier. Moreover, a sense of responsibility will inculcate in between both the parties. Further, whenever you contact them via any mode they will respond to you and give a specific answer. Often you get an improper picture of the product. The picture can be either dark or captured from one angle. So you should always ask for more photographs. Until you like the bag, never purchase it. So, it is important that you get the real picture of the product before purchasing. This will help you to know if there are any defects in the products. Secondly, you will get the product with proper finishing. Thus, it will not be wrong to say that you can know the overall quality of the product. You can check each and every thing minutely. It is advisable to check the delivery methods also. Usually providers offer different methods suitable to them. When the provider says 40 days, it means that 40 days actually can take around 60 days to reach you. There is also EMS that will take 15 to 20 days. Checking the price of item is the most important thing to do when purchasing the bags. You can compare the prices and opt for the one that suits you best. 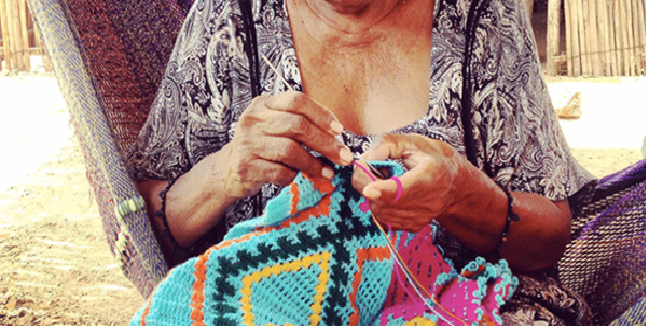 The art of weaving and crocheting is a cultural practice in Wayuu. This art has been inherited by them from their ancestors. This is only their means to earn and express their feelings about life, how they feel and what they want. It will not be wrong to say that weaving patterns indeed guides their thought process. From the tender age of 12 years, the girls here are taught this art. And it becomes a part of their cultural traditions and legacy. Thus, if you are interested in the collection of these bags then you can check for the best wholesale bags online.